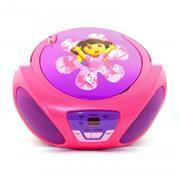 This Dora the Explorer boombox functions with 2 Digit red LED displays the shows the current CD track number. An AM/FM radio is included, as well as built-in speakers. The CD boombox runs on either the AC Cord or 7 "C" batteries, allowing for portability.